7W 300LM Mini LED Flashlight Torch Adjustable Focus Zoom Light Lamp ( Head of the flashlight can be pulled out to focus the beam)Super mini size, bright, blinding effectSkid-proof design & waterproof design.Output bright can come to 300 lumens (MAX). 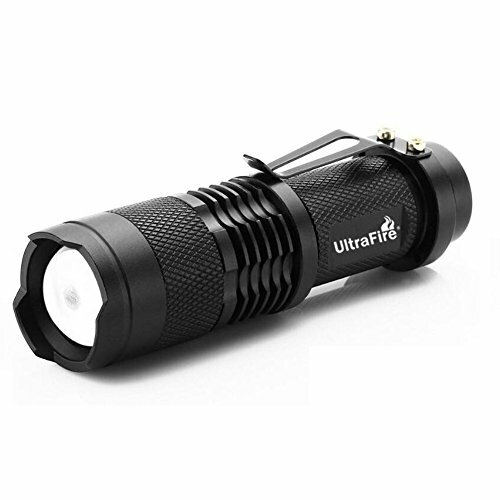 This mini flashlight can use AA size Alkaline, NiMH, and lithium 14500 batteries.Output bright 300 lumens (MAX);Power : 1 * AA/1 * 14500 3.6v Battery (no included)Skid-proof design & waterproof design LED bulbs, producing super bright light Perfect for hunting, cycling, climbing, camping and outdoor activity etc. Visible, Maximum Voltage Self-Defense The Guard Dog Inferno is one of the most intimidating civilian tactical flashlight stun guns you can buy. 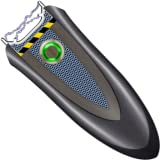 With four pronounced prongs emitting two simultaneous bright sparks, the Inferno stun gun flashlight will deter anyone potential assailants, incapacitating them with six million volts, while a loud zapping sound will attract attention and help. With all this power, the Inferno is the best stun gun for visible and dependable self-defense. Brighten Up Dark Corners Every Day The LED bulbs in the Inferno heavy duty flashlight stun gun are bright enough to light up the darkest alley, corner or parking garage. With all of this lumen power, the Inferno doubles as a very effective everyday household flashlight, with the fully rubberized, non-slip body ensuring a safe and comfortable grip and a nylon holster providing convenient storage. Stay Safe and Secure The Inferno’s safety features make it easy to use as a flashlight – even for kids. The on/off safety switch ensures that they will not engage the stun gun voltage accidently, and a handy safety cap prevents inadvertent damage to the powerful stun gun prongs. Guard Dog Inferno Dual Spark Stun Gun Flashlight Features: 6 million volt, dual spark stun gun Intense 200 lumen flashlight Easy-grip rubberized body On/off Safety switch Protective safety cap Rechargeable battery Charging cord Nylon holster Safety is no accident. Buy your Stun Gun Flashlight today! Powerful Protection This Monster stun gun flashlight combo is tough, stylish and provides powerful stopping power when you need it. Delivering an impressive 18 million volts to any potential attacker at the touch of a button, the stun gun with flashlight will immediately disable and disarm an assailant, giving you time to get away. 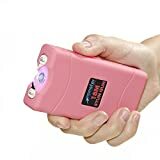 Fully rubber-coated, this compact stun gun is just 4" tall x 2" wide x .75" thick, and delivers a punch that has hardly been seen, felt and heard by a tactical stun gun of this size. Built-in Stun Gun Flashlight Ideal as part of your daily carry, this high voltage Monster flashlight/ stun gun also features a built-in LED light, useful for identifying assailants and illuminating small areas after dark. Supplied in a convenient nylon flashlight stun gun holster with belt loop, it is rechargeable and features a built-in wall plug charger so you’ll never get caught without it. Safe and Secure For complete peace of mind, the Monster Stun Gun Flashlight has an integral safety switch, ensuring that you won’t accidentally discharge it when you don’t want to. Feel more confident when you’re on the go, knowing that your stun gun flashlight combo is ready to be deployed when you really need it. Guard Dog Monster Stun Gun with Flashlight Features: 18 million volts with loud zapping sound Built-in flashlight Safety switch Rechargeable battery Built-in charger Nylon holster Safety is no accident. Buy your Stun Gun Flashlight today!